Okay, so I knew that picture would get your attention. I mean yum, just yum, yum!! 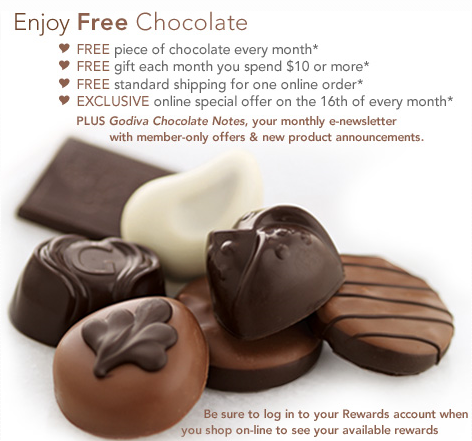 Christy, emailed me to tell me that if you sign up for the Godiva Reward Club (FREE to sign up) you get some tasty benefits. Like a FREE piece of chocolate every month, a FREE gift when you spend $10 or more, special offers, FREE shipping for online order & money saving coupons. So what are you waiting for, sign up here so you don’t miss out on all that delicious chocolate.